In recent years, both developed and developing countries have become increasingly concerned about managing economic growth without depriving future generations of a sound base of natural resources and a healthy environment. It is clear that sustainable development depends upon the implementation of energy policies which incorporate environmental needs while at the same time providing for social and economic growth. The key to meeting this challenge is to optimise world energy use and supply options, including renewable energy. This requires careful planning and formulation of coherent and suitable energy policy that fulfils national goals without compromising the environment and the international commitments to safeguard it in a sustainable development paradigm. Energy is crucial input in developing economies for three main reasons: energy fuels a competitive economy, energy utilisation affects the environment, and energy use may affect national security. Each countries may adopt policies suited to its own particular circumstances. Smart policy decisions can make a difference in how well we realise our national goals. 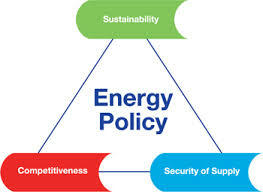 Certain general principles should guide the formulations of the energy policy of the nation. To provide energy security and to work towards the eradication of fuel poverty so as to meet the goals of sustainable economic development. To maximise energy productivity and improve the quality of life. 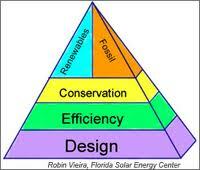 To encourage cleaner, more efficient forms of energy supply, and the use of renewable energy resources. To ensure reliable and affordable energy services and commodities required to fuel stable economic growth. To limit the adverse environmental impacts associated with energy production, distribution and use from the available energy supply options. In order to meet the challenges outline so far, an appropriate energy strategy needs to be put in place involving mechanisms for restructuring energy demand, and promoting clean energy. Energy planning has to be done keeping in view specific national priorities. Increasing the role of cleaner, more efficient and renewable methods for generating/supplying it. Restructuring and reducing energy demands. A realistic long term assessment of energy needs in all sector of economy, targets for producing sufficient energy. The strategy also needs to examine the possibility of creating ENERGY SERVICES COMPANIES (ESCOS). Public concerns and public pressure on decision makers. 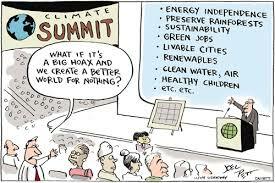 Dramatic instances on environmental problems. Awareness and scientific understanding of the key issues. That is why national preferences and policies differ from each other. South Asian developing countries depend critically on the adoption of appropriate technology as a basis for expanding and improving their energy systems. Many of the technologies that could be usefully applied by developing countries are cost prohibitive, despite the fact that they might also bring significant environmental gains. The wider adoption of some of the bio fuels and solar technologies is currently hampered by bottlenecks in R&D. Adoption rates for solar energy technologies will thus depend on further advances in innovation, economies of scale in production and economies of “learning by doing”. 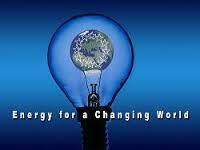 Energy technologies co operation and transfer for sustainable economic development becomes very important. Impediments to technology transfer includes a lack of engineering skills, shortages of investment funds, inadequate evolution of commercial energy markets and retention of intellectual property rights or patents by energy companies in the industrialised world. An intensive and coordinated attention should be given to improving the managerial and technical capabilities in recipient countries. Training should be provided on a long term basis together with the technology being transferred. Technical management programmes should be expanded, placing particular emphasis on public/private partnerships. Entrepreneurship development skills should be cultivated as well. The message is thus is to invest in people. Society is making increasing demands for better living conditions, better safety, and better use of vital and scarce resources include secure and economic energy supplies and services. These key societal will only be solved if in addition to developing technologies, the socio economic context is approximately analysed and taken into account in the energy policy. The social indicators are as important as the technical indicators. 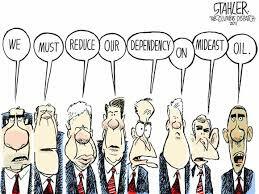 Energy has been a major international policy issue for a very long time. It gained great attention in the 1970s as a result of the 1973 and 1979 oil price shocks. The vulnerability of all economies to energy price and supply fluctuations became evident to government policy makers and consumers alike. Oil importing countries confronted serious balance of payments problems. India is currently negotiating with Iran to bring a pipeline via Pakistan by the year 2010. This may well be a test case of cooperation between two key member countries of SAARC region. Many such initiatives may well crop up within SAARC later on. Energy figures as a key concern in many international agreements. In the SAARC region, a working group on energy has recommended many energy policy initiatives such as establishment of SAARC energy centre, regular exchange of energy information, and joint strategies for the wholesome development of Renewable Energy within the member states.